OK this is another instalment in my collection of articles about how the premium WordPress theme Catalyst: it may not be free but it allows even the technically terrified to do cool stuff! On of the things that I like about Catalyst is that its one theme that I can use for everything – from a mini-site to this site, to a client’s professional site. I use Catalyst for all of them. Today I’m concentrating on using Catalyst with Adsense. Now there are plenty of WordPress plugins that promise to manage your Adsense easily with any theme. But plugins have their own issues- every plugin you add to a site adds a level of complexity and invariably need upgrading every time WordPress upgrades, and sometimes they break and sometimes they even send a quiet percentage of impressions to their author’s Adsense publisher ID! There are a number of ways to deal with Adsense using the Catalyst theme – I think I have the simplest – and I will point you to a couple of alternative solutions at the end of this post. 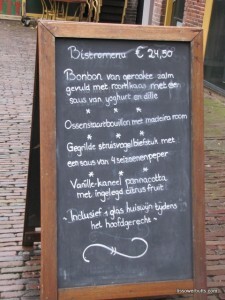 My Dutch is about at the same level as my php - I can recognise enough to order lunch but I don't speak it! My requirements for when I want Adsense to show – and more importantly NOT to show on my websites come straight from the terms of service provided by our friends at Google. I only want to display at most 3 ad units and 3 link units on any one page. I want an ad block to show at the end of the post and in the sidebar – but only on single posts – not on the front page. Now if you know php you will be already shouting something like “use php if single command to only display on single posts” – but remember I’m an idiot and I don’t know anything about php, I struggle in html and my CSS only got fluent since the last upgrade of Catalyst gave me the brilliant – “hold your hand point and click CSS builder” thingy. If you are used to free themes you may expect that every page and post has to have the same basic layout of sidebars and widgets. With Catalyst there is no such limitation, Every post and page can have a different layout. 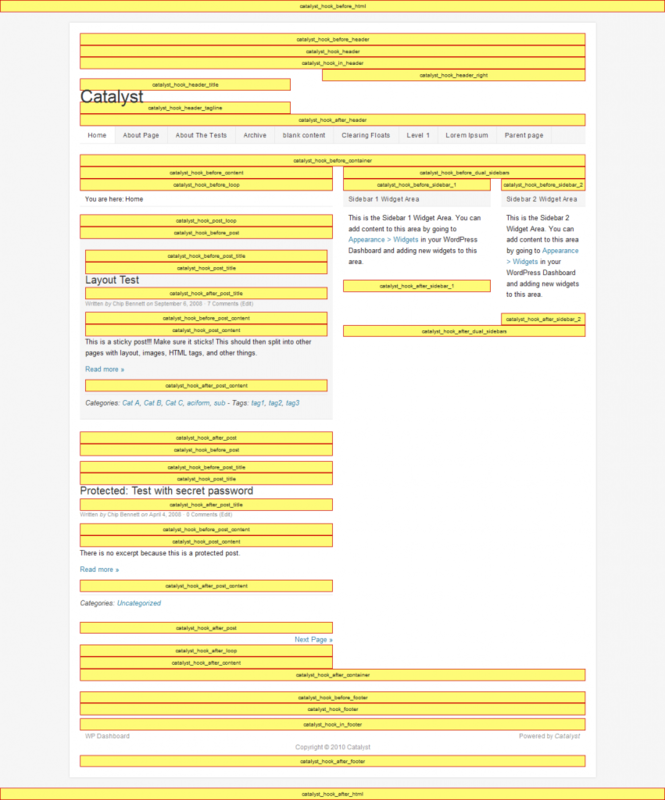 I also create a layout for each post page I want to display Adsense on – this I called “postpage”. Now for the custom widgets – I create three widgets: bottominpost, rectangleinpost and headerlinks – I think you get the idea what I might be putting in these! Each custom widget is hooked into a different place on the catalyst theme – a hook is just where you attach a widget into a theme – that’s how I have the yellow boxes below the header on this blog – there an awful lot of them – here is the visual for the main default catalyst home page hooks! For each widget I have the option as to which of my layouts I want to use the widget on: so I control that none of these widgets show on the supportpage layout – but the headerlinks and rectangleinpost widgets shows on the default and the postpage layouts and the bottominpost layout shows only on the postpage layout. You may be getting the idea about now – using descriptive names is good- because you end up with a lot of widgets! Now head over to your widgets page and drop text boxes in all your new widgets – into each text box drop the correct piece of Adsense code – job done! Bonus – using the layouts will give you a new sidebar (if you chose that option) on your posts – so you can toss another tasteless skyscraper Adsense block in there as well. RT an American living in the Philippines has a similar approach to mine and wrote How To Display Adsense on a Single Post with Catalyst Theme as a guest post for Costa. But because he isn’t using layouts he’s forced to use the evil php stuff in his widgets – ugg! Seriously there are lot of ways to achieve the same result in Catalyst – all of these approaches will get you to the same place – but your mileage may vary depending on your skills and exactly what you are trying to achieve. I tell you what however you do it – once you have used the power of a decent framework theme like Catalyst you will NEVER EVER want to edit theme’s code again – just avoiding the whole drama of upgrading and losing all your customizations is so worth avoiding! Oh and yeah – honking big affiliate link for Catalyst here! I’d be curious to hear from others doing something similar with a fancy theme – or are you all using plugins?